Walter Hilffert Andorff German/ Jewish. Measurements : 26 ½ x 38 inches without the frame. 30 ½ x 42 inches with the frame. The work is dated 1958 and signed Walter Andorff for Walter Hilffert Andorff. 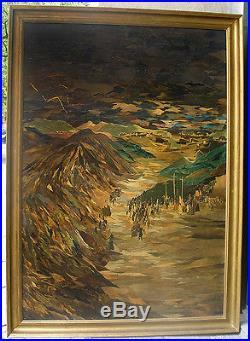 A listed German/ Jewish artist. Born in Germany in 1900 and worked with motifs from the Jewish culture like synagogue interiors, everyday life and portraits. He escaped to Denmark during World War 2. Sadly, little information is available on him today. Huge impressive paper collage, made with numerous little pieces of colored paper. The scene depicts the route to Golgotha, or Calvary, the hill on which Jesus was crucified. Filled with tiny details and a top quality piece of craftsmanship. One of its kind and a collectors dream! Ask us for a quote A certificate of authenticity will be included with this work. (see photos) There are some few smudges and scratches on its surface, due to the old age. The original salon frame has minor scratches due to the age. United States/ Canada: 40 dollars. The more you win the more you save. All our items are located at our gallery in Copenhagen, Denmark. Delays can happen for a number of reasons, but if we are contacted then we will assist you in resolving the holdup as best as we can. The item "Walter Andorff (German/ Jewish Artist 1900) Golgotha. Dated 1958" is in sale since Friday, June 23, 2017. This item is in the category "Art\Mixed Media Art & Collage Art". The seller is "fine-scandinavian-art" and is located in Copenhagen. This item can be shipped worldwide.